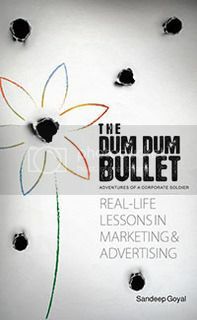 After reading Konjo, by Sandeep Goyal, I was instantly curious to read up his previous book – The Dum Dum Bullet. I laid my hands on it recently and finished it within a week. The name of the book is from the bullet factory at DumDum Arsenal near Calcutta, where the author equates life in corporate to a bullet. The tagline of the book states – “Adventures of a corporate soldier” and who better than Sandeep to recount his adventures. Sandeep is the founding chairman of Dentsu India Group and was the CEO at Zee. Prior to this he served as the president of ad agency Rediffusion DY&R at a young ripe age of 35 itself. The book recounts an insider’s view of the dynamic advertising world in India through the 80’s to the 21st century. It is a real life account of life in advertising, and has an anecdotal style told in a humorous fashion. It has real life incidents involving many corporate doyens from Anil Ambani and Sunil Bharti Mittal and corporate ranging from Citibank to Bhutan Board. The book gives a biographical feel, where the author recounts incidents and learnings right from his days as a management trainee in a paint company in the hiterlands of Rajasthan to his rise in the corporate world. Throughout the book Sandeep’s perseverance, his quick thinking and his fresh ideas come across. Right from the instance in Nerolac Paints, where a Calendar for the dealers was part of the annual marketing expense. Sandeep suggests shooting hot models on the calendar with Nerolac branding and personalizes it for the dealers with their names on it. The dealers now were purchasing the calendars in hordes as a gift item to their customers. An Expense item was now a sales item, with a much higher reach in terms of branding. Such simple ideas and wonderful execution is what set apart Sandeep from others. The book is a wonderful easy read for anyone interested in the basic working of corporate India, and especially the advertising industry. I like this web site very much, Its a really nice post to read and find info. « The tragedy of life is what dies inside a man while he lioar &sequv; by Albert Schweitzer.